We will be heading down to Buenos Aries for a teachers’ workshop on the use of Aqua Republica in classrooms on 24th Sept. Find out more here! Many of the sessions in this year’s Stockholm World Water Week have highlighted the upcoming Sustainable Development Goals (SDGs) and how various organisations can help achieve those goals. Our session, “Serious Play – Virtual World for Water Education” focused on using ICT to educate about an ecosystem approach to water resources management and highlights how digital serious games can be an additional tool to help educate, build capacity as well as to enable communication between the many users of water. We had a very lively and interactive session and the discussions and feedback we had confirms that we are heading towards the right direction of innovating and disrupting water education. We look forward to more partnerships and hope to see the increased use of innovative approaches in this sphere! Winning team of the Serious Play Session in Water Week 2015 with director of Cap-Net UNDP, Themba Gumbo (on the right)! 17. 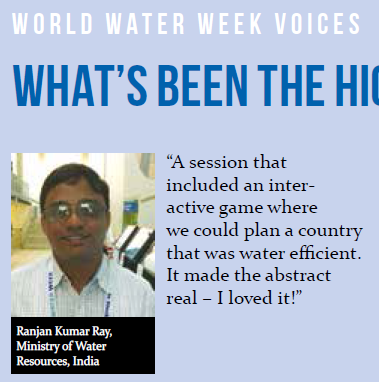 August 2015 | Join us at Stockholm World Water Week! Join us at the event if you are attending the conference! For other sessions organised by DHI and UNEP-DHI in the conference, please find out more here. DHI-WASY together with DWA (German Association for Water, Wastewater and Waste) organised a competition with Aqua Republica at the recent WASSER Berlin International Congress and it was a great success! Participants had the chance to compete in managing their own catchment between international students groups, trying with different strategies to solve problems in water balance in the game. We would like to thank all those involved in making this event possible. We would like to extend our thanks to all participants, co-organisers and sponsors in making this year’s challenge a very successful one.